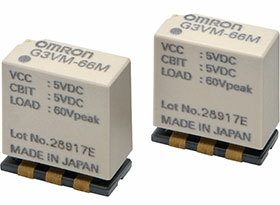 Omron Electronics’ G3VM series MOSFET relays feature performance, size and characteristics ideally suited for a variety of industries, including automated test equipment, medical equipment, instrumentation, security equipment, automated meter reading, automotive diagnostic equipment and communications. Relays are available in 1- and 2-pole configurations, and have a rated input voltage of 5 V d.c. and a load voltage of 50 V, with a peak continuous DC current of 400 mA at 25°C. They come in a surface-mount package measuring 11 x 10 x 5 mm.